For students to have the confidence and competence to apply skills, we first must take the time to teach them about the skill, demonstrate how the skill looks in action, and provide opportunities for practice and feedback. Objective: Students will be able to apply and demonstrate their knowledge and understanding of the selected health topic. To ensure that your students develop the skills and knowledge needed to lead healthy lives, you must plan and implement an effective health education curriculum. Lesson Planning for Skills-Based Health Education is a highly practical and useful resource for middle school and high school health educators looking for innovative and tried-and-true ways to implement a skills-based approach to health education. The text—written by renowned authors Sarah Benes and Holly Alperin, along with experts in the field, including many SHAPE America Teacher of the Year honorees—offers effective, skills-based learning activities, lessons, units, and assessments that you can use in your classroom as they are or with modifications to meet the needs of your students. You can use this text to build a completely new curriculum or to supplement your existing curriculum, providing a smooth transition from a content-based approach to a skills-based approach. The authors explain the rationale and foundation for making that transition, putting the lesson plans, activities, and assessments in context for you as you learn how to implement a skills-based approach. designed to be flexible and adaptable to meet the needs of a wide range of educators, from those wanting a complete new curriculum to those wanting to simply supplement their existing curriculum while meeting the needs of all students. 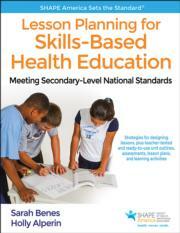 Lesson Planning for Skills-Based Health Education is an ideal companion to The Essentials of Teaching Health Education, another book by Benes and Alperin, which presents teaching and assessment strategies for planning and implementing a skills-based approach to teaching health education. Together, these two books can help you effectively teach skills-based health education from day one. Lesson Planning for Skills-Based Health Education offers a detailed, easy-to-use learning activity template and employs a teacher-friendly format that has been proven effective in the field. It comes with a web resource that has digital versions of the many reproducible forms in the text. Lesson Planning for Skills-Based Health Education offers you all you need to put a skills-based approach into practice: the solid foundational information that explains the concepts and the resources, tools, and strategies to help you implement the lesson plans and activities that will aid your students in developing proficiency in the skills emphasized in the national standards. Through this text, you will be able to offer instruction that challenges your students and provides them with opportunities to meet the standards in a classroom environment that is engaging, thought provoking, and relevant. Lesson 4: Is It Healthy? Lessons 7 and 8: Who and What Is in My Neighborhood? Lesson 3: What Would You Do? Lesson 1: I Wish I Could Talk To . . . Lesson 2: What Does Effective Communication Look Like, Sound Like, Feel Like? Lesson 6: What’s Your Story? Lessons 7, 8, 9, and 10: Let’s Communicate Together! Lesson 1: Decisions, What Decisions? Lesson 2: How Do I DECIDE What to Do? Lesson 1: There Is Life After High School . . . Where Do You Want It to Lead? Lesson 1: What Is Advocacy? Lesson 3: Data, Data Everywhere! Resource for K-12 health education teachers and administrators. Supplemental text for undergraduate- and graduate-level health education teaching methods courses. Sarah Sparrow Benes, EdD, CHES, is a senior director and lecturer in graduate health sciences at Merrimack College. Sarah teaches a variety of undergraduate- and graduate-level courses in health sciences, does service projects in local communities, and conducts research on health education and physical activity in schools. Dr. Benes was the program director for physical and health education programs at Boston University for six years before coming to Merrimack College. She has numerous publications in refereed journals and has written chapters examining health education; she has also made more than a dozen presentations on skills-based health education and related topics at state and regional conferences. Sarah serves on a variety of health education committees, including the health education council for SHAPE America (Society of Health and Physical Educators) and is the former vice president of health education for the Massachusetts Association for Health, Physical Education, Recreation and Dance. Benes is consulted by school districts on health and wellness issues, with a focus on skills-based curriculum development and implementation. She is a certified health education specialist and a member of SHAPE America. Sarah received a bachelor degree in athletic training from the University of Connecticut, a master degree in education from Boston University, and a doctorate in curriculum and teaching from Boston University; she is currently working on a master of public health degree. She lives in Natick, Massachusetts, with her husband, two daughters, and yellow Labrador retriever. She enjoys spending time with her family on nature walks and enjoying the sights and sounds of the Northeast. Holly Alperin, EdM, MCHES, is a clinical assistant professor in the department of kinesiology’s health and physical education program at the University of New Hampshire. Throughout her career, Holly has worked to improve the health and academic outcomes of young people by leveraging partnerships that strengthen school-level policies and practices, both in the health education classroom and throughout the school. In addition to her teaching of preservice and graduate health and physical education majors, she provides training and technical assistance to preK-12 educators, administrators, and staff and develops and implements trainings to advance the capacity of state and national stakeholders to improve the health and academic outcomes of children. Holly is a sought-after presenter, having been invited to numerous local, state, national, and international events. She is an advocate for ensuring that health educators receive high-quality professional development, and she takes this responsibility to heart. Volunteer roles have included participation on a variety of professional task forces for organizations such as SHAPE America; American School Health Association; and New Hampshire Association for Health, Physical Education, Recreation and Dance. Holly received her bachelor degree in health education and health promotion from Central Michigan University and her master of education in policy, planning, and administration from Boston University. Holly currently lives in New Hampshire with her husband and two daughters. Together they enjoy the best of New England—ocean, mountains, cities, and countless adventures. The web resource includes digital versions of reproducible forms. All ancillary materials for this text are FREE to course adopters and available online at www.HumanKinetics.com/LessonPlanningforSkills-BasedHealthEducation.